24. Wonder Woman – Live! The Cinema Guys recorded this special episode at Paper Street Trading Company on Wonder Woman Day! Can you guess what they’ll discuss? How does Wonder Woman fit into the DC Extended Universe as well as fulfill a much needed gap in the comic world as the first female super hero? The Guys and The Cinemaiden had fun hanging out and meeting fans. They also discovered The Full Frontal Nerdy Cincinnati folks and so should you! Now sit back relax and enjoy this very special episode of The Cinema Guys! The Cinema Guys would love to hear from you! Send a suggestion, comment, or a request to thecinemaguys@134ink.com or leave a message at 513-409-GUYS. Follow on twitter and Facebook. 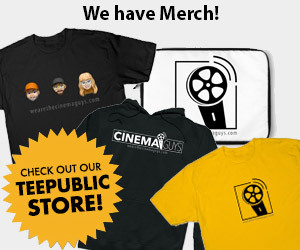 If you enjoy the show help The Cinema Guys out and become a patron!